The following article by Stephen Buck describes how he substituted MSE (Model Signal Engineering) levers in his MODRATEC Interlocked Lever Frame. © The content of this article copyright 2012 Stephen Buck. Send email for Stephen Buck via MODRATEC. For my model railway, I'm installing full signalling and interlocking. To control this I've constructed a well designed MODRATEC lever frame. The frame has 30 levers which will control 16 signals, 6 sets of points, and 3 facing point locking bars, leaving 5 spare levers. The frame went together well, with great support from MODRATEC and their SigScribe4 software for designing the interlocking. MSE offer complete kits for lever frames, without interlocking, and the very nice looking cast levers are sold separately. The levers come with a spring for the latch but no latch mechanism. I designed a latch mechanism with a pivoted latch. 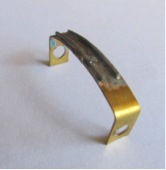 The components are manufactured from 0.4 mm brass strip, and the latch lever, the latch lever mount and the latch are all from 4 by 25 mm 0.4 thick brass. The pivots are M1.4 bolts, and the operating links 0.7 mm spring steel wire. The lever shaft for the MODRATEC levers is 3/32 inch diameter. I drilled out the pivot holes on the MSE levers to 5/32 inch and pressed in a 9.6 mm long piece of brass tube 5/32 inch OD, 1/8 ID. On the end levers in each bank of 6, longer tubes are required. For each group of six levers, I placed a single length of tube 1/8 inch OD, 3/32 ID over the existing steel shaft. The upper hole cast in the lever was used to activate the interlocking mechanism. I made a gauge to locate the hole for the latch, the dimension from the lever pivot to the latch pivot being 43 mm. 6mm brass flat has been soldered to the levers for lever plates. The MODRATEC levers are at 9.7 mm centres, except between levers 6 and 7 (and after every additional 6 levers), which are at 16.5 centres. I made new lever guides from 0.4 mm flat bar, for the narrow spaces 6 mm wide, and the wide spaces 12 mm. This results in a minor error in spacing but this can be compensated for using the clearance on the bolt holes for the lever guides, to obtain even openings for the levers. The MSE levers are 2.5 mm thick, so the gap each side of a lever is around 0.5 mm, which is quite acceptable. MSE 0.7 mm square nickel silver bar is soldered to the lever guides to provide stops for the latches. The bar is trimmed after assembly to obtain the required adjustment of lever position. 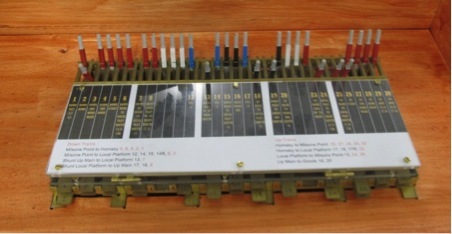 The switches provided by MODRATEC make, when pulled over, in the Off position. I use slow motion point motors and want switching with the lever in both positions, On and Off. One option would be to use relays. I chose to replace the switches with Jaycar [Ed. An Australian retailer of electronic components.] microswitches which are 10 mm thick, so stacked, they are at slightly more than the lever centre distances, but not significantly more. 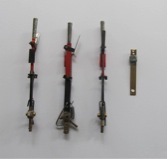 The Jaycar microswitches are mounted using simple angle brackets and two 3mm rods running through the switches. As modified, the lever frame looks a lot more realistic. The pivoted latches work well in the Off position, but not as well in the On or normal position. The lifting latch offered by MSE on their frames may work more effectively. The lever springs foul the support angles on the frame, and it would be worth enlarging the cutout on the angle if building a frame from scratch. Mixing components from different manufacturers causes some compromises, in particular on the centre distances between levers. But, as noted above, as I see it, the frame looks a lot better, and the microswitches avoid the need for relays.